Kissamos is a town in western Crete, lying in the homonymous Gulf, west of Chania, with about 5000 inhabitants, the seat of the new Municipality of Kissamos (with a total area of 334 sq. km. and a population of 11,820 inhabitants). The ancient Kissamos, a coastal town on the northwest coast of Crete, was the ancient port of Polyrinia, the oldest Doric city of Crete, 7 km south of Kissamos and once a major navy and commercial center. Kissamos flourished after the Roman conquest of Crete (in 69 BC). Ancient historians like Pliny places the city near Pergamum and Cydonia, while Ieroklis between Cydonia and Kantanos. The “city of Kissamos,” as reported by Ptolemy, is presently situated at the Gulf of Kissamos, in the ruins near Kastelli, the Venetian fortress. Although Kissamos was the seaport of the major city Polyrinia , it functioned as an autonomous community and had its own currency. The coins depicted the head of Hermes on one side and a dolphin with the letters HR / Io on the other. Because of its wealth and location, Kissamos was always well fortified. The city walls were built by the Venetians and their departments are still preserved. The feature of the city was the Venetian fortress, Castel, after which the now village was named: Kissamos or Kastelli Kissamos (in order to distinguish it as Crete had many forts by that name). Nowadays the region’s economy is based more on the wine it produces, its oil production and other agricultural products, as well as in its touristic development. This small town has become a busy tourist resort. From Kastelli Kissamos you can visit the worth visiting sites of Polyrinia and Falassarna, the impressive gorge in Topolia, the islands of Gramvousa and the lagoon of Balos. 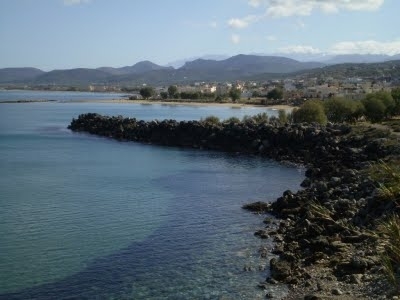 Kastelli is located 40 km west of Chania. If you choose to get there by car, take the National Road from Chania to Kissamos. It is aprroximately a 1 hour drive. If you choose to drive, take the National Road to Rethymno and Chania. Do not enter the city of Chania but continue straight on to Kissamos. It is about 1.5 and 2.5 hours’ drive respectively. Take a bus from Rethymno or Heraklion to Chania. When you arrive to the Ktel bus station in Chania you have to change buses to Kastelli Kissamos. For your convenience pay attention to the hours of arrival in Chania and the ones leaving to Kastelli.